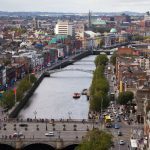 Dublin is the capital and largest city in Ireland, which occupies the greater part of the island of the same name. It is situated on the east coast, near the middle point of the island, at the mouth of the River Liffey. Its metropolitan area has a population of almost 2 million inhabitants. It is a modern and vibrant city that concentrates most of the cultural, commercial, financial and industrial activity of the country. There, you cannot miss the famous Guinness brewery, Dublin Castle or stroll along the bustling O’Connell Street. 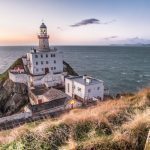 Another option for those who want to get away from the city is to visit the small fishing village of Howth, just 20 minutes by train. 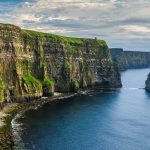 The Cliffs of Moher is one of Ireland’s major tourist attractions, located on the west coast of Ireland, about 260 kilometers from Dublin. It consists of an area of ​​cliffs situated on the Atlantic coast that extend for eight kilometers. They reach an impressive height of up to 214 metres. They are an impressive natural landscape – they have been nominated to be part of the 7 New Wonders of Nature – and is also a natural habitat for many species of birds. 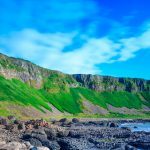 The Giant’s Causeway is a spectacular formation of 40,000 hexagonal and pentagonal columns, whose geological origin is derived from the cooling of the lava in a crater, about 60 million years ago. However, the mythological explanation described in the Celtic legend of the island speaks of the struggle between two giants, one Scottish -Staffa and another Irishman -Finn MacCool-. According to the legend, this rock formation is fruit of the confrontation between both, that gave victory to the Irish giant. It is located between the cities of Derry and Belfast. 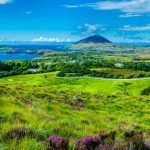 Connemara National Park is one of the six national parks in Ireland and main tourist attractions in the country. Within the park you can climb Diamond Hill, from where you can see one of the best views, including the only Irish fjord, Killary. Located in County Galway, the National Park was opened 35 years ago. It has an area of ​​almost 3,000 hectares of mountains, peatlands, heathlands, grasses and forests. It contains remains of human civilization, like megalithic tombs 4,000 years old. Much of the land was in the past part of the site of Kylemore Abbey, which is located within walking distance of the park and is also highly recommended to visit. 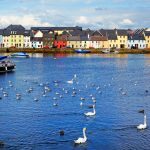 It is the capital of County Galway, on the west coast of the island. It is a small but very lively town with a large university population. It used to be a fishing village and today it has become a modern town with a lively nightlife and shopping. The Latin Quarter of the city brings together street artists and visitors, highly recommended to enjoy a pint while enjoying live music. At Galway Cathedral, you can visit its spectacular dome over 44 meters and where, in summer, music concerts are held. It is a small fishing village situated on the east coast of Ireland with much to offer the tourist. It is 30 km from Dublin city centre. 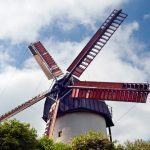 One of its greatest attractions is the traditional windmills, which show today how the wheat was formerly milled. The fishing port is one of the most important for fishing for shrimp, also because a large colony of marine animals surround it. There is also a yacht club and beachfront restaurants to enjoy a quiet meal. The three Aran Islands make up an archipelago located at the mouth of Galway Bay. They represent the final frontier of Ireland facing the ocean. Their names, Inis Mór (Inishmore), Inis Mean (Inishman) and Inis Oírr (Inisheer), the first being the largest and the last, the smallest. 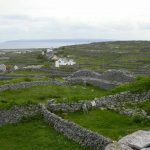 On Inishmore you can visit Dún Aongusa (Dun Aengus), a famous prehistoric fort of the Bronze Age, located at the top of a cliff 100 meters high and for many visitors, the main attraction of the islands. From a cultural point of view, it is important to emphasise the preservation of Gaelic customs, such as language and traditional crafts. 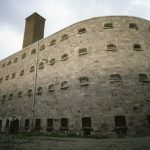 The former Kilmainham Gaol was inaugurated in 1796 and served to imprison all types of prisoners including children. In the nineteenth century the building was extended, imitating the model of the London prison of Pentonville and included a dome of light that invited redemption and repentance for its prisoners. The aforementioned extension has served as the stage for the filming of the famous film “In the name of the father”. Today, visitors can access the cells that held numerous people involved in the struggle for Irish independence for more than 100 years. Howth is an old fishing village, with a marina, located about 15 kilometres from the Irish capital. A meeting point for fishermen, it welcomes numerous tourists attracted by its interesting bird population. Also, marine mammals, such as seals, often come to the port to be fed by visitors. Inside Howth, the castle of the same name, the Gaisford St. Lawrence family resides there. Although you cannot visit its interior, it is interesting to get closer to explore its elegant gardens. 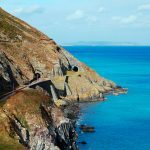 Close to Howth is Ireland’s eye, where ecclesiastical remains of an ancient monastery are preserved and from where a great variety of birds can be seen. The island of Ireland’s Eye can be visited exclusively in summer. Bray is a town located 20 km south of Dublin which lies on the northern edge of County Wicklow. From Bray’s promenade a famous route begins through a cliff-top walkway and provides one of the most spectacular views of the East Coast. The road begins at Bray promenade and ends at the port of GreyStones. The route follows the train line, so you can choose this mode of transport and comfortably enjoy the views. The cliff road was established during the construction of the train line, to facilitate the transportation of man and merchandise.